New Zealand is missing 500,000 houses because of its inability to build at the same rate over the last 30 years as it did between the mid 1940s and the late 1970s. That’s the view of independent economist Shamubeel Eaqub, who has analysed New Zealand’s house building record since the 1920s. Eaqub presented his findings at the New Zealand Planning Institute’s annual conference in Wellington on Wednesday. He found that New Zealand would now have 500,000 houses more than it currently has if it had built at a rate of more than eight houses per 1000 people, as it did between the end of World War Two and 1980. Instead, the house building rate dropped to around five per 1000 people between the early 1980s and now. That was now being reflected in increased over-crowding in Auckland in particular and a plummeting home vacancy rate. The boom in apartment construction came at a time when our migrant intake began to fall. So big has been the surge in apartment construction – especially in Melbourne and Brisbane – that the RBA is worried about an oversupply of such housing. And then there is the problem of bank-lending practices. Lowe told his audience he is worried that “too many loans are still made where the borrower has the skinniest of income buffers after interest payments”. He noted that “in some cases, lenders are assuming that people can live more frugally than in practice they can, leaving little buffer if things go wrong”. Right now, with record debt levels rising at a time when income growth is flat, apartment construction exploding while population growth is slowing, and all the while house prices in Sydney and Melbourne rising by nearly 20% in the past year, while banks are already starting to raise interest rates, it feels as though the market is at a point where it wouldn’t take much for things to go very wrong indeed. That’s a pretty amazing uptick in apartment building. If we’d been able to get something similar going here the housing situation would look a lot better for most people. Through the National Negotiation on Housing and Infrastructure, the Swedish government has been negotiating with Stockholm City Council, Stockholm County Council, and five municipalities in the city since February 2016 on how to sustainably accommodate future population growth. Under the agreement, 100,370 apartments will be built by 2035 in parallel with a SKr 30.2bn ($US 3.4bn) investment in the public transport network, including SKr 5.1bn for rolling stock and depots. The funding includes grants from the state based on local commitments to housing and tackling congestion. Co-financing from municipalities is linked to the increase in the value of housing and finance from Stockholm County Council will be based on reduced travel times. This sounds quite a bit like a version of the Auckland Transport Alignment Project that also included housing. Interesting approach. Fascinating. Talking of safety, I was at the IPENZ-Transportation Group’s annual conference in Hamilton last month, where I saw a number of great presentations that are worth highlighting to a wider audience. (I also presented a paper, but that’s something I’d like to write about later!) Two papers on safety particularly stood out. there has been no meaningful change in the number of pedestrian fatalities over the last ten years. Although the safe system approach to road safety recognises that people make mistakes and are vulnerable, the main causal factors in pedestrian crash reports essentially blame the pedestrian for crossing the road, with codes such as “poor observation” and “crossing heedless of traffic”. In the context of motor vehicle crashes, human factors are leading to systemic changes in the way that we design safe and forgiving environments, with a particular emphasis on speed management. Unfortunately, there are not many initiatives to reduce the pedestrian death toll directly. This paper presents an investigation into and analysis of pedestrian deaths, serious injuries and hospitalisations between 2006 and 2015. It identifies underlying systemic issues with the way that we approach pedestrian safety; where it is similar to safety for people in motor vehicles and where differences warrant different approaches. The results suggest that pedestrian safety deserves more prominence within New Zealand’s national road safety strategy. To me, this raises a very serious question with traffic engineering in general. A significant share of the reduction in deaths and serious injuries in motor vehicles will be due to improved vehicle safety – ie better crumple zones and airbags and the like. People on foot, who do not benefit from the car industry’s safety innovations, have not experienced any significant reduction in deaths over the last decade. Is it possible that road investment has had little or no impact on road safety outcomes, in spite of the fact that we’ve spent literally billions ‘upgrading’ roads? New Zealand is currently reviewing its procedures for setting speed limits as part of the “Safer Speeds” component of the national road safety strategy. A big topic for discussion is the planned greater use of speeds limits below the standard 100 km/h rural or “open road” speed limit. Many people (including politicians, transport practitioners, and the general public) remain sceptical that reductions in the posted limit alone can have much effect on driver speeds and safety outcomes. Fortunately, New Zealand has two past case studies from which to draw conclusions on this matter. Firstly, in 1973, the open speed limit was reduced from 55mph (88 km/h) to 50 mph (80 km/h), largely as a fuel conservation measure. Then in 1985, the 80 km/h open speed limit was raised to 100 km/h, partly to reflect prevailing operating speeds. 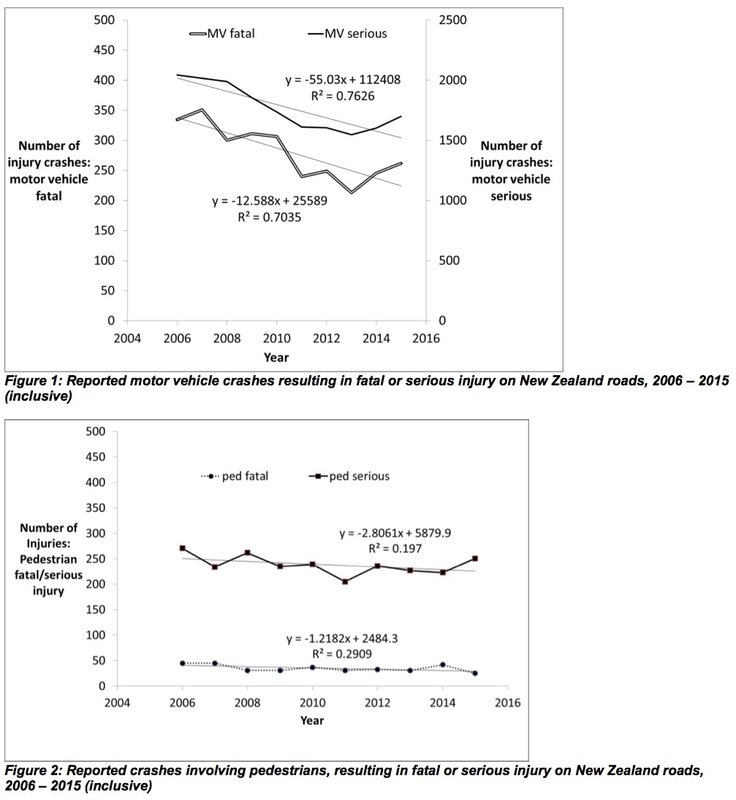 In both cases, vehicle speeds and crash data were able to be monitored before and after these changes (as well as other trends in NZ transport) to determine any effects resulting from the open speed limit changes. A reduction in the open speed limit, as seen in 1973 was accompanied by a notable reduction in rural fatalities and injuries relative to their urban counterparts. An increase in the open speed limit, as seen in 1985, was accompanied by a notable increase in rural fatalities and injuries relative to their urban counterparts. Why is it so hard to find a car park? The council estimates 7000 people will return to the central city over the next 12 months, and according to Colliers Real Estate there will be 14,100 office workers west of Colombo St by next year. Construction workers on the Justice Precinct and Christchurch Hospital rebuild are competing for parking in an area that attracts more than 6500 hospital staff, patients and visitors on a daily basis. The West End car park building between Cashel and Hereford streets will be opening in April. An Accessible City street works have sucked up close to 400 on-street car parks, and an unknown number have also disappeared into the Metro Sports and Convention Centre sites. Demolition sites used for temporary car parking are slowly being built on. Before the earthquakes CBD office buildings had to include a specified number of car parks, but the Christchurch Central Recovery Plan changed that and now only mobility and bike parking are compulsory. As a result large office blocks lacking parking bays are scrambling to lease spaces in nearby commercial parking buildings. For example, the Canterbury District Health Board’s corporate offices in Oxford Terrace house 400 staff but have no car parking. Wilson Parking currently has about 1200 parks on empty lots and prices range from $1 to $5 per hour, or $3 to $15 a day. Parking buildings tend to sit around the $4 an hour and $12 a day mark. Parkable​ is the new kid on the block and aims to have 1000 Christchurch spaces listed on its website by the end of August. The Auckland-based company has an app that matches up commuters with private property owners who have spaces to let. They range from vacant driveways to spare car parks at empty office buildings still seeking tenants. Hourly prices are between $1 and $3, with a maximum of $12 per day. The city council earns $4.5m a year in parking charges and almost the same from parking fines and enforcement. Once costs are deducted parking makes a $555,284 surplus. Haymes says charges for the council’s new Lichfield Street parking building are likely to be similar to those of other parking buildings, and a proposed upgrade of street parking meter software would introduce credit card “tap and go” payments. He says they are also working with CBD businesses so that car park users may get a discount if they purchase something from a contributing retailer. But he’s clear any subsidy would be met by the businesses involved and not the council. With only $6m left in its budget for car parking the council is keen to get private sector developers involved in any future car park buildings – understandable given new buildings cost anywhere between $30 and $50m. EVEN if the new headquarters that Apple is creating in California does not prove to be “the best office building in the world”, as Steve Jobs boasted shortly before his death in 2011, it will be an astounding sight. The main building resembles a flying saucer with a hole in the middle. Through its large, gently curving windows, workers will eventually look out on a wood containing some 7,000 carefully chosen trees. It is as though a race of high-tech beings has landed on a pristine planet. And then, unfortunately, there’s the car park. For 14,000 workers, Apple is building almost 11,000 parking spaces. Many cars will be tucked under the main building, but most will cram into two enormous garages to the south. Tot up all the parking spaces and the lanes and ramps that will allow cars to reach them, and it is clear that Apple is allocating a vast area to stationary vehicles. In all, the new headquarters will contain 318,000 square metres of offices and laboratories. The car parks will occupy 325,000 square metres. Apple is building 11,000 parking spaces not because it wants to but because Cupertino, the suburban city where the new headquarters is located, demands it. Cupertino has a requirement for every building. A developer who wants to put up a block of flats, for example, must provide two parking spaces per apartment, one of which must be covered. For a fast-food restaurant, the city demands one space for every three seats; for a bowling alley, seven spaces per lane plus one for every worker. Cupertino’s neighbours have similar rules. With such a surfeit of parking, most of it free, it is little wonder that most people get around Silicon Valley by car, or that the area has such appalling traffic jams. Parking can seem like the most humdrum concern in the world. Even planners, who thrill to things like zoning and floor-area ratios, find it unglamorous. But parking influences the way cities look, and how people travel around them, more powerfully than almost anything else. Many cities try to make themselves more appealing by building cycle paths and tram lines or by erecting swaggering buildings by famous architects. If they do not also change their parking policies, such efforts amount to little more than window-dressing. There is a one-word answer to why the streets of Los Angeles look so different from those of London, and why neither city resembles Tokyo: parking. That’s it for the week! See you next time! All of the links are going to one page. Not on my computer. I tried 10 different links and they all worked. Maybe it’s just two or three – can you say which ones they are? Japanese train engineers are just crazy good. Check this out. http://en.rocketnews24.com/2014/11/19/1200-japanese-workers-convert-above-ground-train-to-subway-line-in-a-matter-of-hours/ Wowo.. lowered a train in one night.. I see.. Perhaps they could come to Auckland for a month ? A rather misleading title to this article- the 4 hours refers to the final block of line to cutover between the old and new lines. Still a pretty impressive achievement but no doubt dictated by the unacceptability of any longer shutdown period from both transport and political perspectives. The Apple story just proves how dumb it would be to adopt minimum parking rules without having some form of dispensation procedure to make sure they are not mindlessly provided when they are not truly needed. I am very glad we never went down that track in Auckland. Apple would probably face an uphill battle to get such a dispensation, even in Auckland. Their new headquarters / circular supervillain lair is located immediately next to a major highway and is surrounded by low-density residential development and a strip mall. The nearest train station is 6km away. On the other hand, it’s also including a terminal for its own private bus fleet. My suspicion is that it wouldn’t necessarily meet most of the criteria for a significant reduction in the parking requirement. Of course, these outcomes – the low-density zoning in an area with massive demand for housing and the scarce rapid transit provision in Silicon Valley in general – are part of the same overall problem. Regulate for low densities -> get car-based development -> require parking in response -> social and economic catastrophe -> refuse to change. I too am glad that Auckland is choosing to unravel its own Gordian knot of urban and transport planning. Now I am learning more about Apple’s new building. Apparently they acquired all the land by 2006, but didn’t get planning approval until 2013. It’s only started to be occupied this month. Now, Apple is richer than Creosote, so I’m sure the delays haven’t hurt their bottom line, but it kinda illustrates why housing and office space is so expensive in the Bay Area. It’s interesting that the Valley is not without Transit, both Caltrain and now BART is slowly extending its way there, (both look like they’ll be knobbled by the new Federal government de-funding Transit). But this location is just daft. It will require bus shuttles to access these fast and high capacity service to SF and the rest of the Bay Area for ever, or of course be stuck in traffic. A permanent inefficiency. Interestingly Tesla is, by contrast, is now adjacent to a new BART station on the sadly shortened extension. Though access is still circuitous because of the severing roads and rail line. The new station, with the evocative name Warm Springs, is planned to reach over the rail line soon. But is, like most US Transit Stations, islanded by acres of parking… Hopefully some smart new tech company will build on that carpark one day! That sadly short extension to BART cost $1b. BART is part of the problem with Bay Area transit unfortunately because it costs so damn much. Caltrain currently carries >60k passengers per day on slow, clunky design hauled trains that run every hour and take an hour and a half to cover the short distance to SF. It’s incredible how much demand there is but the insanely poor regional planning in the Bay Area and more broadly California doesn’t allow for common sense to prevail. Everything here has to be gold plated, stand alone (non integrated and non incremental) programs like BART. The south and east bay would have been better served by electrification of Caltrain and the Warm Springs subdivision through to Oakland for that price. Follow up with electrification to Gilroy the ACE corridor and Capitol Corridor and it would have a modern rail system that allows you to get everywhere in northern CA including 5 minute frequencies between SF and SJ, and SJ and Oakland. Err? I you’ve mis-read it; no one here is in favour of Parking Minimums, quite the reverse in fact. Good initiative. It may also be worth submitting requests to AT and NZTA to find out whether they have previously undertaken safety audits of the area, eg when designing the roads. If you dredge up anything (or even just want to raise the question publicly) feel free to get in touch with us about a guest post! Peter, is raw incidents a better measure here than per capita? Probably, and over the 12 years shown, would show a steeper slope on both graphs – for car occupant fatality and injury as well as for pedestrian fatality and injury. It is the difference between the slopes of the two graphs that is of interest. Engineers love to design where there is data. I’d prefer incidents per km travelled. According to the Household Travel Survey, there has been little change in the total kilometres walked over the last decade. (Or perhaps even a small decline.) Meanwhile, total kilometres travelled by car has increased. So I would expect a more complete comparison to accentuate the difference, rather than reduce it. Peter, I’ve put out feelers for information in many directions, but need to put in an OIA to NZTA. I’ll ask what baseline studies have been done of pedestrian safety in the local residential roads of suburbs surrounding the Waterview Connection. My question to you is, shall I also ask for whatever general traffic data they have: baseline and forecast? I’d like to know how they modelled for induced traffic. But I suspect someone here at Greater Auckland might already have that data. Do you know? Thanks. Asking for the traffic data and forecasts is also a good idea. I don’t think we’ve received that in the past. There may be something on the archives from way back in the day, when the consent hearings for Waterview were happening. Anecdotally, I don’t think NZTA *did* consider induced traffic to any reasonable degree. They’ve been scrambling around widening SH20 and putting ramp meters in place on the tunnel, which suggests that they’ve just realised that induced traffic could have a negative effect on the tunnel operation. Definitely drop us a line – it’s an issue that needs some sunshine if you’re willing to provide it! Will keep in contact, definitely, and I’ll request all that data. Rumour is that the ventilation became a problem only when they realised that traffic congestion might not just “ease” but in fact could get worse! My!.. Hence the assumption that ventilation could be assisted by the traffic flowing through the tunnel pushing the exhaust fumes out might be invalid, and stationary cars might actually just sit in their own exhaust with insufficient ventilation. I wouldn’t like to believe such a terrible rumour. Surely it’s just made up. But had me laughing all the way to my bicycle. Let’s consider Germany, June 1945, a devastated land. Within five-ten years they had rebuilt all the destroyed houses, hell they had rebuilt entire CITIES. And yet NZ – a country with a stable government, a large workforce, no war damage – can’t do the same?